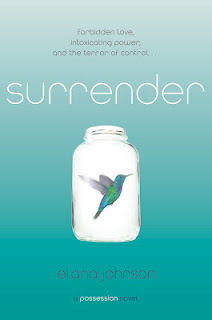 Surrender by Elana Johnson is out today (the sequel to her debut novel Possession)! All of that changes when Raine falls for Gunner. Raine’s got every reason in the world to stay away from Gunn, but she just can’t. Especially when she discovers his connection to Vi’s boyfriend, Zenn. Raine has never known anyone as heavily brainwashed as Vi. Raine’s father expects her to spy on Vi and report back to him. But Raine is beginning to wonder what Vi knows that her father is so anxious to keep hidden, and what might happen if she helps Vi remember it. She’s even starting to suspect Vi’s secrets might involve Freedom’s newest prisoner, the rebel Jag Barque…. Elana’s also doing a “never surrender” blog hop next week. If you’d like to participate, click here to sign up! So excited for Elana! Thanks for shouting about about her release. It's an awesome book. Elana really knows how to spread the word. I've seen her everywhere today. Go Elana!